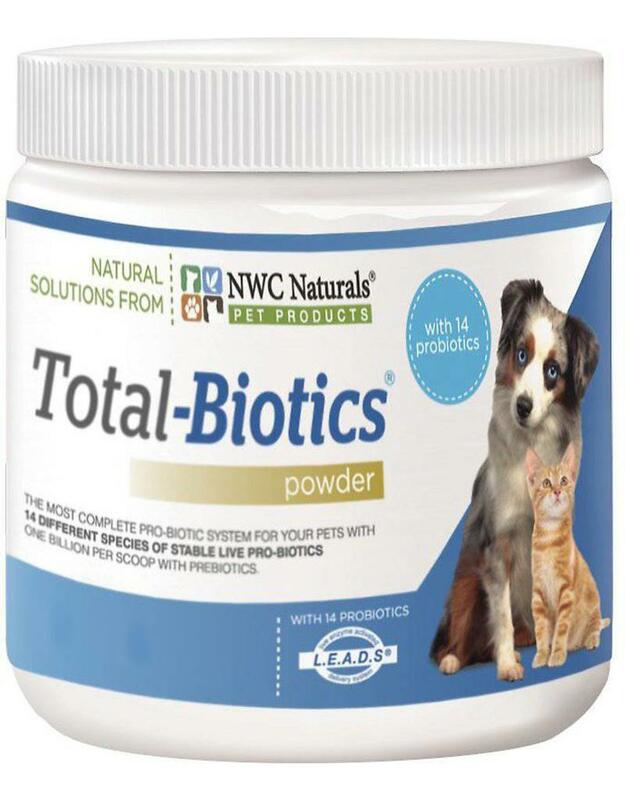 NWC Naturals Total-Biotics Probiotic is great for your dog or cats daily routine! This particular probiotics features a blend of 14 different species of live pro-biotics and prebiotics. Using this in your pets every day diet can help to support the digestive system, immune system, and energy levels. This product can also help to support normal bowel movements and keep their skin and coat healthy and shining! Proudly made in the USA in a GMP-certified facility with no GMO’s! This powder is tasteless and will blend right into your pets food! Ingredients: A Proprietary Blend of Inulin from Chicory Root (Prebiotic Dietary Fiber), Pure Live Lactobacillus Acidophilus DDS-1, Bifidobacterium Bifidum, Bacillus Coagulans, Bifidobacterium Breve, B. Lactis, B. Longum, L. Brevis, L. Bulgaricus, L. Casei, L. Plantarum, L.Rhamnosus, L. Salivarius, Lactococcus Lactis and S. Thermophilus. L.E.A.D.S. ® Live Enzyme Activated Delivery System®. An Exclusive Proprietary Delivery System of Calcium Amino Acid Chelate, Magnesium Amino Acid Chelate, Beet (Root), Amylase, Cellulase, Lipase and Magnesium Glycyl Glutamine. Feeding Guidelines: Add 1 scoop of Total - Biotics® to each cup of any pet food every time the pet is fed.